Gilligan & Gould have done it again, with a richly rewarding narrative that doesn’t even need Breaking Bad to leave a mark. I know what stopped me. And you know what? It’s never stopping me again. I wrote in my piece right after Better Call Saul’s premiere that this would be an opportunity for Vince Gilligan & Peter Gould to have some fun with a “lighter, less serialized” series. That turned out to…not be true. Not that Saul doesn’t have consistent moments of levity — Bob Odenkirk is a gifted comedian, after all — but that the show began to wield a surprising dramatic power. Sure, the travails of the put-down Jimmy McGill, con man-turned-scrappy lawyer, aren’t on the same scale of Walter White’s rise to the Scourge of the Southwest, but that doesn’t matter. The emotional impact, particularly the closing scenes of “Five-O” and “Pimento,” hit like Mike Ehrmantraut sock to the jaw. A less steady hand on the wheel, and we’d be talking about a show that had no control over its tone, recklessly lurching from genre to genre one week to the next. One that was filled with references to its predecessor for the sake of it, and didn’t have enough “there” there for anyone who had never seen Breaking Bad. Instead, more than just filling in a few gaps in Albuquerque’s timeline, Better Call Saul is a tragicomic, Horatio Alger-infused story about a man who tries to Break Good, but the universe just won’t let him. 1. “Uno”: The Garage. Early in the series’s run, we see the first draft of the lawyer that would become Saul Goodman, defending a trio of ne’er-do-wells in court — the only kinds of clients he can get are the ones who are already guilty. We remember Saul as a huckster, as quick with a movie quote as with a legal loophole, but we soon learn that that life wasn’t the one Jimmy originally wanted. His struggle comes out of a desperate desire to be taken seriously, as a lawyer and as a human, and the only person who seems willing to give him that is Kim Wexler. In a brilliantly lit scene taken out of classic Film Noir, she’s the femme fatale with the light, and he’s the hard-boiled Humphrey Bogart. But the images the characters want to present, and who they really are in the daylight, are vastly different. 2. “Mijo”: The Desert. The appearance of Tuco Salamanca seemed to signal that nods to the Breaking Bad-verse would be abundant, but Better Call Saul is too clever for that. It was actually a bit of a masterstroke to have the quintessential BB moment — out in the vast expanse of the New Mexico desert, a crystal blue sky overhead — early, like a feint. It wouldn’t be long before Saul evolved into its own animal, with a different pacing and style, but the blackly comic scene where Jimmy first bargains for his own life, then the lives of the dingbat skater brothers, showed that this new series could go that direction — and succeed — if it wanted to. 3. “Nacho”: The Phone Call. The most important thing, again, is that Jimmy didn’t set out to become Saul. All he wants is the respect of his brother, Chuck, and that means “doing the right thing” instead of following his baser impulses. In “Nacho,” that means placing an anonymous phone call to the insufferable, pea-brained Kettlemans, warning them that someone might be coming to steal the money everyone knows they have. It’s a huge moment for him, but the next day gets him squeezed from all sides, giving him the opportunity to really prove his cleverness by proving that the Kettlemans, in fact, kidnapped themselves. 4. “Hero”: The Billboard. Jimmy tries to reconcile the two halves with an elaborate publicity stunt, where he rescues a worker dangling off a billboard with his giant face on it. It makes him a hero in the media, and is unsurprisingly a huge boon for his business. The loser here is Harry Hamlin, who — we’ll eventually find — is not the villain Jimmy believes he is. It’s fascinating to play back the first few episodes of the season knowing what we know now about Hamlin, and Chuck. Meanwhile Jimmy swings back and forth on his moral pendulum, arguing with himself like Gollum. Some days he’s James McGill, others he’s Slippin’ Jimmy, accepting a bribe from the Kettlemans for keeping quiet. 5. “Alpine Shepherd Boy”: The Hospital. Chuck McGill’s, ahem, condition — “electromagnetic hypersensitivity” — could have been a source for cheap jokes, or just have been a distraction from the main narrative. Instead, it allowed us to see a much more human side of Jimmy. He loves his brother deeply, and though it becomes clear in this episode that he never really thought Chuck’s problem was legitimate, he indulged it because (say it with me) it was the right thing to do. This comes to a head after Chuck collapses, and Saul gives us a brutal series of scenes at the hospital. Jimmy defends his brother, even to Kim, and lets Hamlin feel the full force of his wrath. A strong moment for Odenkirk, but the best was yet to come. 6. “Five-O”: Mike’s Confession. 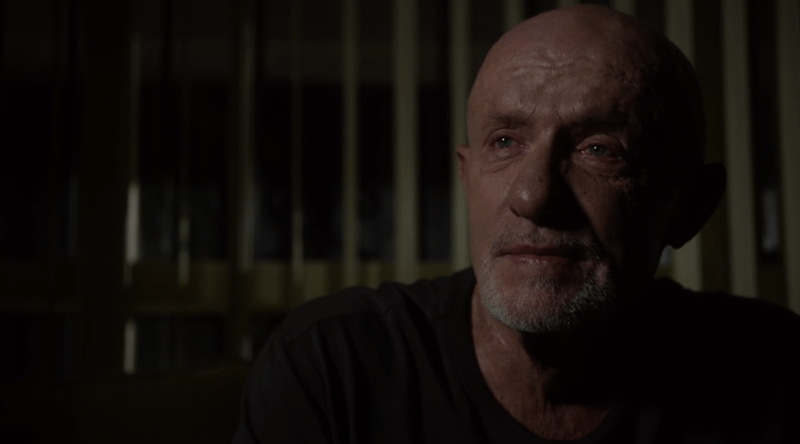 Perhaps what excited audiences most was the prospect of seeing more of Mike Ehrmantraut doin’ work, and of Jonathan Banks playing him. I don’t want to be reductionist and just say “Boy, we didn’t know Banks had that in him,” but seriously — we didn’t, not really. Banks has made a career out of playing professional but world-weary heavies, and with his monologue at the end of “Five-O,” he had a bigger emotional moment to land than he was ever given on Breaking Bad. And he nails it. Maybe the content — cop gets revenge on the guys that killed his son — was boilerplate, and maybe it wouldn’t have hit as hard if we didn’t already love Mike, but it was nevertheless a career moment for Banks, and a new high water mark for the show. 7. “Bingo”: Jimmy Saves Kim. We still don’t exactly know the history of Jimmy & Kim’s relationship. (By the way — how great is Rhea Seehorn? Lauren Bacall lives!) Clearly there was something romantic there once, and though it didn’t work out, the two are still on friendly terms. In fact, they seem to be more loyal to each other than to anyone else; this is exemplified in “Bingo,” when the Kettlemans have fled HHM (and Kim) in the face of a generous plea deal (God forbid those two admit any guilt), and end up back on Jimmy’s door. Jimmy then makes the ultimate sacrifice: he gives up all that money, and the new office, to redeem her in the eyes of HHM. When he breaks down at episode’s end, as he kicks a trash can and leans against the office window he’ll now have to vacate, it’s heartbreaking. 8. “RICO”: Dumpster Diving. Though Chuck will never see it (and Hamlin can never admit it), Jimmy is a fantastic lawyer for all the reasons he made a great con man: his wits, shamelessness, and most of all his work ethic. When he stumbles onto the case of a lifetime in Sandpiper Crossing’s defrauding of his elderly clients, these are the lengths he goes to: scrawling out a legal letter of demand in Sandpiper’s bathroom, diving into their mountain of adult diapers to collect shredded documents (a hysterically funny scene that just keeps going and going), and painstakingly recreating those documents until he and Chuck find their smoking gun. If he had been allowed to see it through, he would have been set for life, not just financially but in earning the praise he craves so desperately. But unfortunately, if not surprisingly, Chuck had other ideas. 9. “Pimento”: Chuck Comes Clean. The end of “Pimento” was the most devastating yet, and Odenkirk’s finest moment. Having discovered that it was his own brother all along, and not Hamlin, who kept blocking Jimmy in making partner, Jimmy finally faces Chuck down, the dam bursting until all of Jimmy’s hurt and self-loathing pours out . But instead of copping to the betrayal, Chuck doubles down in his arrogance; he will only ever see his brother as “Slippin’ Jimmy,” who once got arrested for pooping in someone’s sunroof, and not as the good man he has slowly, painfully become. To Chuck, Jimmy will never be worthy. Where we see Jimmy’s online degree and Elder Law specialty as industriousness, Chuck sees cheapness and shortcuts. It’s a rift in their relationship that may never be reconciled, and lends Saul Goodman’s actions in Breaking Bad — actions of a man who has been told all his life who and what he is, and that nothing can change it — new layers of tragedy. 10. “Marco”: The Coin Scam. Perhaps strangely, the season finale returned to that lighter, “comic” tone that was promised when it first began. Jimmy visits his old stomping grounds in Cicero, Chicago, and reconnects with Marco, his old scamming partner. (Marco is played by Mel Rodriguez, who is just as delightful here as he is in Last Man on Earth. I need Mel Rodriguez to pop up everywhere.) The episode’s centerpiece is another long, dialogue-driven scene, where we see Jimmy and Marco pull off a con involving a rare coin with the confidence and subtlety of Newman & Redford. A full week of neon-lit swindling follows, scored to Rat Pack-era big band; the whole montage is such a departure from previous weeks, you can feel Gilligan/Gould easing up on the gas. This isn’t the type of show that ends things on a cliffhanger. Instead, Marco suffers a heart attack, and a devastated Jimmy must leave Cicero with only that pinky ring that Breaking Bad fans recognize so well. But he’s not just going back to Albuquerque out of obligation. Casting aside an offer from another law firm (that Kim orchestrated), Jimmy decides to embrace that dormant side of himself. Why not, when all the straight-and-narrow path has brought him is pain? Now, he’ll operate not to earn anyone’s approval, but in the way he does best: never again, as he tells Mike, leaving money on the table. (Or, we can assume, running a nightmarish Bingo game). The production team had a serious challenge in front of them in creating a series that did more than just service the fans of what came before. There’s not a single note in this first season that’s perfunctory, and it all works so well, and is so pleasurable to watch, they’ve created a brand-new set of anxieties: we know how the story ends for Jimmy (or maybe, we only know the middle? Are you excited yet? ), but now we’re left to wonder what happens to Kim, and Chuck, and Nacho. These new characters are more than just placeholders, and their stories aren’t just way stations. And even if Jimmy seems to be just one or two steps away from becoming Saul, Gilligan & Gould are having too much fun to rush it. For that, and for many other things, I’m grateful. I think that your review is great! Breaking Bad is a really hard act to follow,but I think that this could be just as good,Really can’t wait for the next of many series to come. Thanks again,Paul. Excellent review, absolutely agree about the series – when BCS was first announced I was expecting a sequence of weirdo characters turning up each episode looking for Saul to represent them, the actuality is so much more. As engaging as BB but with a slightly lighter touch but still with excellent performances all round.